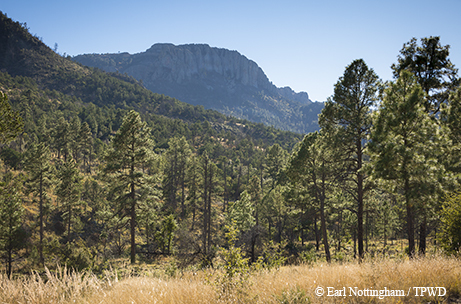 Can the Davis Mountains’ majestic pines be saved? 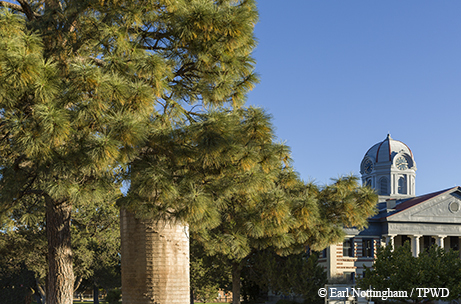 High in the Davis Mountains in West Texas, the majestic ponderosa pine is losing its toehold in this part of the Lone Star State. Extreme drought, severe cold snaps, massive wildfires and incessant infections by the western pine bark beetle have taken a heavy toll. Up to 75 percent of the ponderosas in the Nature Conservancy’s Davis Mountains Preserve have been lost over the past decade, estimates Jim Houser, a regional forest health coordinator with the Texas A&M Forest Service, and he predicts the losses will continue if nothing is done. The Nature Conservancy, which manages the 33,000-acre preserve, has invited the Texas A&M Forest Service to help manage the forest and stymie the ecological losses, first by thinning out smaller trees that compete for water and accelerate wildfires up into the crowns of the mature pines, and later by planting seedlings where stressed ponderosa pines have stopped pollinating. Ponderosa pines at the Davis Mountains Preserve. Chancellor John Sharp of the Texas A&M University System praised the forest service’s efforts to restore the ponderosa forest. “With the proper care, we can save the ponderosas for future generations to enjoy in far West Texas,” he says. Ponderosa pines are found throughout the western United States but grow in only a few spots in Texas, including the Davis Mountains, the Guadalupe Mountains and Big Bend’s Chisos Mountains. The tree thinning was tackled successfully in the Davis Mountains, but the planting of seedlings presented a problem. The question was how to obtain indigenous seedlings when many pine trees at the preserve weren’t producing cones. Houser and two forest service colleagues — Bill Oates, the agency’s associate director, and Jim Rooni, head of Central Texas operations — were discussing that problem on the courthouse lawn in Fort Davis when one of them looked up. “It was kind of a [Sir Isaac] Newton’s apple moment,” Houser recalls. The ponderosa pine they were standing under had cones. Pine trees on the courthouse square, in front of churches and in the yard of a county commissioner are all descendants from the forests of the Davis Mountains. Decades ago, Fort Davis residents either planted seedlings or transplanted small trees from the mountain canyons, irrigating the pines through droughts and nursing them to full growth. Mickey Merritt, a forester for the Texas A&M Forest Service, checks the health of a young ponderosa pine at the Davis Mountains Preserve. A ponderosa that towers more than 80 feet over Beth Francell’s yard in Fort Davis came from a seedling her uncle transplanted in the 1930s from near where the McDonald Observatory stands today. “I was tickled to death to be part of the collecting of cones,” says Francell, who would send photographs of the cones to Houser to determine the right time to harvest. The town’s pine trees became the maternity ward for another generation of ponderosas. Operation Ponderosa, as it was dubbed, had begun. When the cones were ready, the Texas A&M Forest Service contracted for a private arborist and a truck with a lift to pluck pine cones from the top of the town’s trees. About 20 bushels of cones — about two pickup loads — were harvested and shipped to a Louisiana seed company that dried the cones and collected the tiny seeds within. Those two pickup loads of cones produced a handful of seeds, literally — about a third of a pound. The seeds were preserved in a freezer at a forest service greenhouse in Idalou, outside of Lubbock, until it was time to plant them in the greenhouse. The following spring, forest service workers sprouted 2,300 seedlings from that one-third pound of seeds. 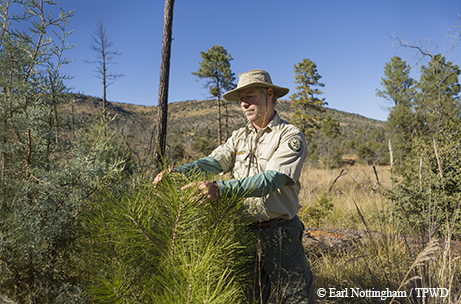 By the fall of 2015, with forest thinning well underway, it was time for Houser and a team of forest service volunteers to return to the Davis Mountains Preserve. The Davis Mountains are considered a “sky island” ecosystem — one of three in far West Texas — where the isolated mountains are surrounded by a “sea” of desert. The altitude provides a cooler and wetter climate than the rest of the region, and the mountains provide habitat to mountain lions and bears as well as a number of species — plants and animals — that are not found elsewhere in Texas. Descendants of original Davis Mountains pines, several ponderosa pine trees in the town of Fort Davis provided the seeds used for the reforestation of the stressed pine forest at the Davis Mountains Preserve. “It’s a very restricted habitat,” Houser explains. The forest service is trying to discover — and then duplicate — the best planting methods to increase the odds of the seedlings surviving.Some are planted in triangular test plots with 10 seedlings each. Weed mats cover some; herbicide is applied to others. Most seedlings are just planted wild. There are two planting seasons in the experiment: November and again during the monsoon season in late summer. The Texas A&M Forest Service and the Nature Conservancy are focusing their replanting efforts on 350 acres of the 33,000-acre preserve. In November 2015, as Houser led a group of forest service volunteers past the stark, bare trunks of dying or dead ponderosa trunks, he warned, “They can come down in 10 seconds or another four years.” Ten minutes later, Houser’s warning was affirmed when the group’s return back down a mountain trail was blocked by a giant ponderosa that had just fallen. Despite their best efforts, forest service workers know they are trying to defy the odds. Some experts have warned that less than 20 percent of the seedlings may survive. On a return trip a few weeks later, Houser found about 10 percent of the seedlings plucked from the ground by gophers. “It’s like Caddyshack,” Houser says. Meanwhile, Francell back in Fort Davis has discovered a rotting hole in the top of the massive ponderosa towering over her yard. Fortunately, the forest service had given Fort Davis residents seedlings as a thank-you for participating in Operation Ponderosa. Francell has three. She hopes at least one will prove as hardy as the seedling her uncle brought down from the Davis Mountains so long ago.